Like Warren Buffett’s legions of followers, we enjoy reading his annual letter. He writes as clearly as he thinks. Buffett’s also a great interviewee, and his TV appearances with Becky Quick on CNBC are engaging – although it’s quicker and almost as illuminating to read the transcript. “Heinz was started in 1869. So it had all that time to develop various products, particularly ketchup, things like that. Part of Buffett’s success has been improving upon the Graham and Dodd principles that defined his formative investing years. He recognized that demanding a discount to intrinsic value overlooks the intangible value of brand. His 1988 purchase of shares in Coke (KO) was an early example of this. KO currently trades at 11X book value. Their consistently high return on equity supports this high multiple. The brand is KO’s “moat”, generating far more profit than an unbranded carbonated, sugary beverage would. Kraft Heinz has iconic brands too, but they’ve turned out to be more vulnerable to low cost competition than many expected. Buffett’s overpayment for the Kraft Heinz combination was in some ways caused by the enduring success of the Coca Cola brand. KO has unrivaled distribution — think of all the places you see bottles of Coke on sale. And tastes are shifting away from some KHC products, such as Oscar Meyer hot dogs which countless households ban because they regard as containing carcinogens. 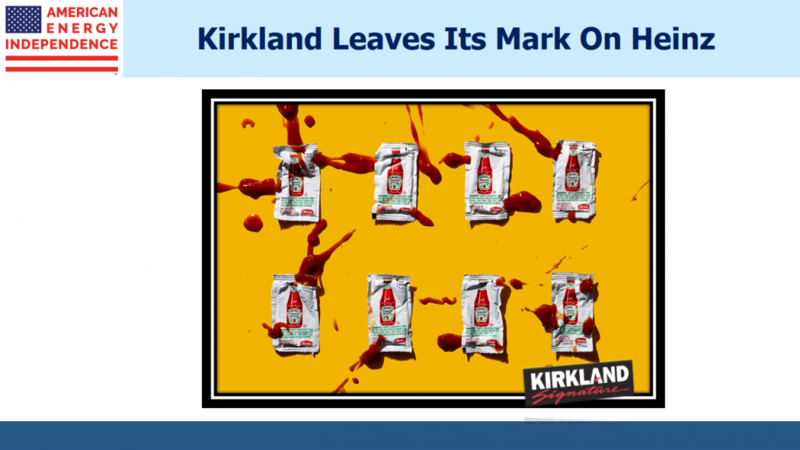 But the broad success of Costco’s Kirkland shows that brands can be more vulnerable than previously thought. The erosion of KHC’s brand value reflects the growing power of WalMart, Costco and Amazon. It didn’t just happen during the 4Q18 period for which KHC took its write-down, but the issue just gained more attention. It’s probably altered Buffett’s thinking too. Moats need to be harder to breach. Energy infrastructure is one sector that’s invulnerable to brand erosion from new competitors, which ought to make it appealing to Buffett. An installed pipeline is unlikely to be threatened by a new one. Tomorrow’s winners in this sector will come from today’s big firms. U.S. energy infrastructure has an enviable moat. Rising dividends, for the first time since 2014, are drawing new investors. We are invested in KHC.